After a great first two rounds, MUAC trekked out to Meadowglen International Athletics Stadium for Round 3 of Shield competition. The stadium atmosphere amongst the estates produced some great performances and a good team effort. The club had fifteen competitors in the pole vault, thirteen in the 3000m and four 4 x 400m relay teams, an indication of the depth and team spirit amongst the MUAC athletes. 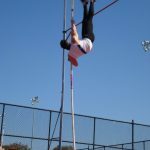 Individual wins started early with a clean sweep in the pole vault: Anthony Hanna, Irie Hill (Open) and Evelyn Burry (Under 16) all winning their divisions. Sophie Barker showed a clean pair of heels, winning the 3000m before doing a second 3000m for training. El Jefe, Stephen Edwards won the high jump while the evergreen Paul Kennedy remains unbeaten in the walks this year. Despite the long drive out to Meadowglen, the rewards for the trip were many with pleasant conditions for racing, the camaraderie of team competition and some fine dim sims from the canteen. Round 4 is on Thursday, 29th October at Aberfeldie, starting at 6pm. MUAC event of the round: 400m. Do It!